Today we are experiencing a late winter snow storm and is a good time to do some more thinking and planning for the garden. Each year we try new things. If they work, we will continue to use them. 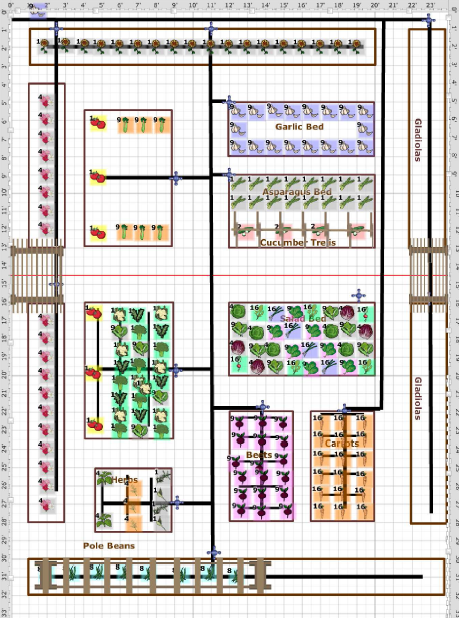 This year the plan is to try two new vegetables and three different growing methods. We have chosen five gardening experiments for the 2015 season. Asparagus bed – We have put off this for about three years, so this year it is time. Roots are already ordered so no turning back. Two varieties we selected are, Jersey Giant and Purple Passion. The roots are sent to us in the spring for planting time in our growing zone. Sweet Potatoes – We have chosen Covington, an early variety that will mature in short season areas. Unrooted vines are shipped in the late spring. With proper care we will be enjoying sweet potato fries this fall. 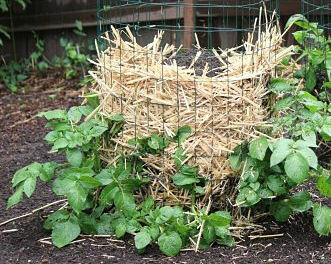 Straw Bale Garden – Plan to experiment with about four bales and try to grow a variety of vegetables. A wood crate structure will confine the sides of the four bales. The plan is to then use the Square Foot Garden Method to plant. More information on Straw Bale Gardens can be found here. Vertical Potatoes – Have always been intrigued by this method to grow potatoes. If successful, we plan to build more towers and eliminate the rows of potatoes from the garden to free up space. Sawdust bed – We were traveling in south-west Nova Scotia when first observed huge vegetables growing in sawdust. The key as we found out, was old sawdust. Old was very old, like 25 years or more! Well near the homestead are the remains of an old mill. There has been no production for over 40 years and there is also a huge deposit of old sawdust. Our plan is to check it out and seek permission from the land owner (if we can find them) and see if we can make our sawdust gardening experiment a reality. We will build a raised bed and again use the SFG method to grow a variety of vegetables and flowers. We are also going to use a mixture of sawdust and compost for our experiment. You are invited to follow us as we update our experiments through the growing season. We also welcome any advice you have on any of our gardening experiments. Please use the comment section on Facebook or on WordPress.